Around the 2nd century B.C. at Ajanta, great shrines and monasteries were carved out of the mountain. THE Ajanta caves, in the gorge of the Waghora river. Ajanta’s paintings occupy the pre-eminent position in the mural traditions of Asia. 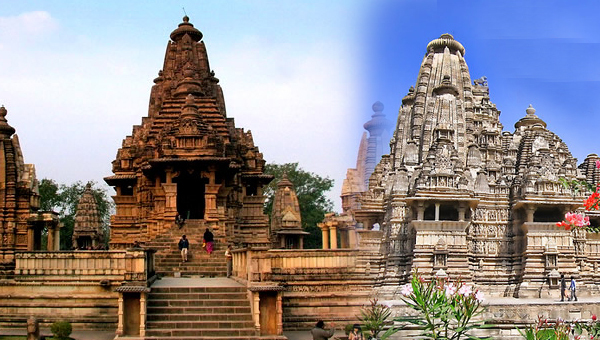 However, its sculpture, among the finest ever created in India, is often not given the attention it deserves. THE story of Indian art is the story of the development of philosophic ideas and a vision of life. Often, with our modern-day understanding, we underrate the importance of art in the early spiritual life of this subcontinent. We forget, for instance, that the artistic image before us is the deity itself, not just an image of the deity. We try to shape subtle and deep philosophical traditions so that they appear in line with the views of today. In another instance, when we read that we are to meditate upon a deity in a mandala until we become that deity, we tend to see that as “becoming like” the deity. That view appears to fit into the present frameworks of understanding. However, in that, we lose the wonder and beauty of a great spiritual tradition; we preserve it only in name. The truth is that the deity is a quality that is within us. By looking upon it, by spending time in adoration (puja) of it, we awaken that beautiful aspect within ourselves. We dwell upon the deity until that aspect grows so completely within us that it fills us: we become that deity. One of the most fascinating aspects of the art of India is that similar artistic and philosophic ideas, with rich regional overtones, are found simultaneously in all corners of the vast subcontinent and in various periods of ancient times. Natural barriers and distances of thousands of kilometres do not appear to have hindered the spread of concepts. This is explained by the fact that knowledge was considered to be eminently important. In fact, it was worshipped. The distilled knowledge of the best of minds was carefully enshrined in sutras, which were handed down from father to son and from teacher to initiate. These sutras travelled to all corners of Indic influence and were received with reverence. 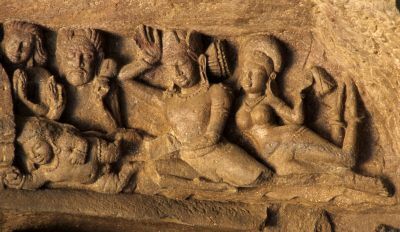 Chitrasutra, the earliest-known treatise on art making, was penned around the 5th century A.D. and comprises details of long-continuing traditions. In these traditions, instead of the concept of individual achievement, there was the acknowledgement of the fact of receiving the finest thoughts of those who had gone before. An individual wished to contribute to the tradition through his personal reliving of the truth. However, he remained worshipful of the tradition created by the vast numbers of thinkers before him. 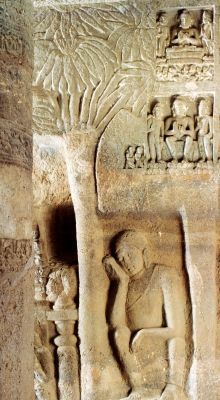 Mahaparinirvana, Cave 26, Ajanta, 6th century. This is a colossal representation of the moment when the Buddha shook off the bindings of his mortal body to attain salvation. The solemn grandeur of the moment is highlighted by the sensitive portrayal of the many monks who grieve the passing away of their master. Best of all, the traditions remained living and flexible as all knowledge was considered to be dead and without value unless it was fully experienced. (In this there is a lesson for present-day educators.) It is only in the personal realisation of knowledge, the reliving of truth, that it has any reality or value. From the 1st century A.D. onwards, deities were created in Indian art for meditation and adoration. The belief was in the oneness of all of creation. The separated forms of the world were maya, or illusion. The Truth was beyond all forms. However, the deities provided one with familiar shapes that were easy for the mind to grasp. By the 5th century, sublime deities were made in central and northern India. Though they were in human form, their purpose was to move us through their grace and beauty, to help us transcend the world of forms and leave behind our attachments and desires. By the 3rd and 4th centuries A.D., very sophisticated forms of deities were being created in the subcontinent. The art of the Krishna Valley and the subsequent depictions of the northern plains, between the 4th and the 6th centuries, focussed upon the inner life of man. In the meantime, near the coast of western India, the tradition of hewing caves out of the mountain continued. Around the 2nd century B.C., at the magnificent site of Ajanta, in the horseshoe-shaped gorge of the Waghora river, great shrines and monasteries were carved out of the heart of the mountain. In the mid-5th century A.D., under the rule of the Brahmanical Vakataka kings, there was renewed activity at Ajanta. Cave 26, exterior. This is one of the last caves excavated at Ajanta. It has within it some of the finest sculptures in all of India. 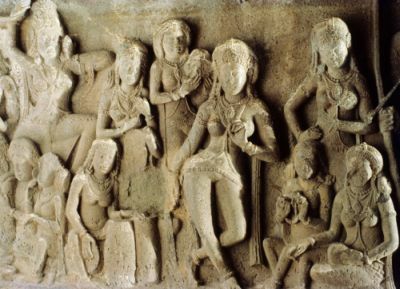 As in the Indic tradition seen earlier in the western and eastern Deccan, feudatories, ministers and even queens freely followed the Buddhist faith and patronised Buddhist caves and art. There were no religious divisions and the patrons of the Buddhist caves sometimes proclaimed their descent from Hindu gods. 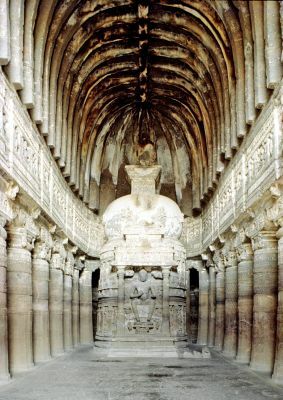 The facades of the early chaitya-grihas presented a grand simplicity. The second phase of Ajanta brought a changed world. Cave 19 of the mid-5th century is the first chaitya-griha, or hall of meditation, of the Vakataka period. The facade of the hall is thickly populated with divine forms. The horseshoe-shaped window above the entrance, based upon wooden architectural models, is more elaborate. It resembles the chandrashala seen in northern Indian temples of this period. Attendant figures can be seen on either side of the window. They stand in graceful postures and the treatment is delicate. Buddhas were made flanking the entrance to the cave. On the right, the Buddha offers his son, Rahula, his rightful inheritance: the promise of salvation, or Buddhahood. On the left of the entrance, he makes a similar gesture of the offer of grace, the promise of enlightenment. The figures have a humanity and sensitivity that gives Ajanta a special place in Indian art. The grace and inward look of the figures are the hallmark of the sculpture of this period. The garments are diaphanous. 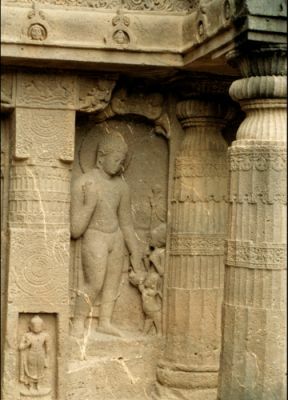 A Nagaraja and a Nagini with an attendant figure are among the finest sculptures of Ajanta. These are serpents made in human form, and such images come from the earliest times in Indian art. Their rapt concentration and inward look immediately grasps us and takes us to a place of peace deep within. The figures are closely similar in style to the ones at the Hindu temple at Deogarh in Uttar Pradesh, of the 5th century A.D. Earlier, the interior of the hall of meditation was simple and unadorned. The focus was on the final Truth, which was formless. Now, it is the beauty of form that serves to reveal the grace that underlies creation. Peace is created by the beauty and harmony around us. Though stupas continue to be made, they are considerably more elaborate. Now the Buddha stands at the front of the stupa to bestow his blessing upon the worshipper. Cave 26 is a grand chaitya-griha, perhaps the last excavation at Ajanta. It is larger and more elaborate than Cave 19. The Buddha inside is again made within a stupa and sits with pendent legs upon a throne. The Maitreya Buddha, who is as yet to come into the world, is often made in this fashion. The circumambulatory path around the shrine is elaborately carved. On the left wall of the cave is a marvellous depiction of the Buddha’s victory over Mara’s armies, which represent the turbulence and confusion of the mind. Mara’s daughters represent the desires that keep us bound to a life of pain in the material world. The Buddha, ready for enlightenment, is serene as he rises above all this. The Mahaparinirvana of the Buddha, when he finally achieves release from the mortal world, is a profoundly moving scene. This is one of the grandest, yet the most sensitive, depictions in all of Buddhist art. The figure of the reclining Buddha is about 22 feet (6.7 metres) long and is best seen from near his feet, the appropriate position for the devotee. The perspective has been made for viewing from this spot. Ananda, his grieving disciple, sits at his feet, desolate at the loss. In the solemnity and grandeur of the noble achievement of the Mahaparinirvana, Ananda adds a human touch, which is unforgettable. Below the Buddha, the same sentiment is echoed in some of the seated figures of monks. Above, heavenly musicians celebrate the great moment of the Buddha’s release from the world of illusion. A number of grand viharas, or residences for monks, were excavated in this period. These are considerably larger than the earlier viharas and are profusely painted. In fact, practically every inch of wall and ceiling space was originally covered with fine paintings. Early literature has many references to such halls of murals, and those at Ajanta are extremely valuable as they constitute the only surviving significant body of early paintings. These exquisite murals are also amongst the greatest treasures of the entire heritage of Indian art. 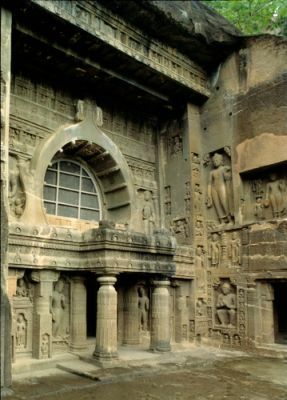 The addition of shrines in the viharas is a new feature, which is seen in this period at Ajanta. The resident monks could now worship the Buddha and meditate on him in the vihara itself. The shrine has an antechamber, which prepares one for entry into the sacred space. The growing complexity of iconography is seen in the Ajanta caves of this period. Besides the Buddhas and Bodhisattvas, in the upper floor of Cave 6, the shrine also has six Manushi Buddhas, who preceded Gautama Buddha. The Buddha figure and other sculptures here recall the grace and transcendent qualities of the art of the Gupta empire, further north. The forms are more full-bodied here. 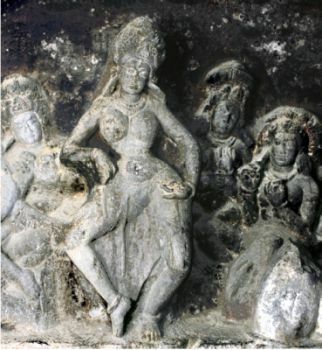 Dancer and musicians, Cave 7, Aurangabad, 6th century. In the dark interior of the shrine of the cave, the grace and sense of movement expressed in this sculpted scene is most remarkable for its period. While the hammer and chisel sounded in the gorge of the Waghora river, work was also being taken up again at the site of Kanheri, in present-day Mumbai. In the late 5th and the 6th centuries, a number of older caves were modified and new excavations were made. 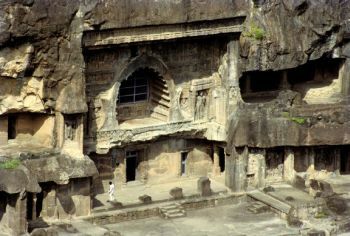 Kanheri became the largest rock-cut cave site in India, with over a hundred caves. 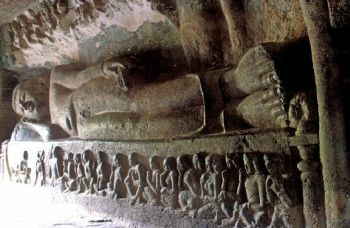 Colossal Buddhas, over 22 feet high, were made on either side of the veranda of the early Cave 3. This is the beginning of the tradition of Brihad, or colossal Buddhas, which spread near and far. They display the gesture of the bestowing of grace. Vidyadharas bring garlands to them. By the 4th century, the method of Yoga, or Yogatantra, was established in Indic thought. It was a graded path of evolution, through discipline and meditation. In the art of the Buddhist faith, Cave 90 of the early 6th century has the earliest surviving mandala, which presents such a graded path. The Buddha at the centre represents the final or universal Truth. The Buddha and the figures around him are the personifications of wisdom and compassion, which lead us to the ultimate knowledge at the centre. CAVE 19 FACADE, Ajanta. There is a gentleness and humanity in the Buddhas sculpted in the 5th and 6th centuries at Ajanta that is unique.The hard rock of the mountain faceis sensitively cut to convey the mosttender moments and emotions. In Cave 41, of the late 5th or early 6th century, is the first known depiction of the Bodhisattva Avalokitesvara with 11 heads. The 10 Bodhisattva heads leading to the final Buddha head above represent the gradual ascent to enlightenment. 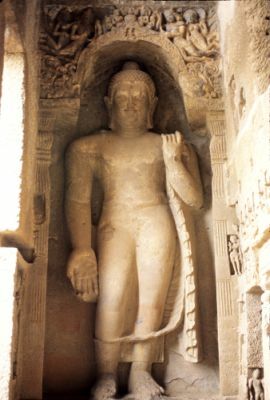 At Aurangabad, not very far from Ajanta, another group of caves was excavated in the 6th century. The earlier caves here are contemporaneous to Ajanta and seem to continue the sculptural traditions of that site. The pillars of Cave 3 have very fine carvings. In the later caves here, sculptural panels were increasingly used to carry the iconographic message. A host of Avalokitesvara panels and panels of other Bodhisattvas can be seen at the entrance to the circumambulatory passage of the shrine. Further inside, to the left of the entrance to the shrine, a panel of Tara with attendants can be seen. These are early depictions of the increasing numbers of deities that were being created in the Yogacharya development of Mahayana Buddhism. The worshipper meditated upon the aspects of the Buddha that were personified in these deities. On the left wall of the shrine, a dancer with six musicians can be seen. This is one of the finest sculptural depictions in the caves of this period. CAVE 19, AJANTA. While the earlierchaityas had simple, though grand,facades, those of the later periodwere profusely sculpted. NumerousBuddhas were made, shownbestowing their blessings andpromising salvation to worshippers. From the 1st century onwards, the depiction of deities was a pan-religious development in Indic art. The most wondrous Brahmanical excavation of the 6th century is on Gharapani Island in Mumbai harbour. The island is popularly known as Elephanta because of the large stone elephant the Portuguese found on it. A great Siva cave here was dug out of the rock on a vast scale. It is about 125 feet by 125 feet (38.1 m by 38.1 m). The entrance is unadorned as is the spacious hall inside. It is on a monumental scale and has large free spaces between great sculptural panels. To the west of the mandapa is the main shrine, with a linga and a yoni representing the unity of all creation: the final completeness, which is beyond the world of forms. The shrine has entrances on all four sides, flanked by monumental Dvarapalas. They are graceful and have the fullness of the earlier forms in the caves of western India. The heavy lower lips and the rapt inward concentration are characteristic of the depictions at Elephanta. A profoundly moving representation of Siva can be seen on the south wall of the cave. The light coming from the three distant entrances of the caves creates a dramatic setting. The image emerges from a dark void as a manifestation of the unmanifest eternal. It is made on a three-foot-high (0.9 m) platform and rises another 18 feet (5.5 m) above that. The image is more a mukhalinga than a figure of Siva. The face on the proper right is the terrible, or wrathful, representation of Siva. He has snakes and skulls in his hair, an angry brow and a twisted moustache. On the proper left is the blissful and gentle face of Siva, as Vamadeva, or of Siva’s spouse, Parvati. The central face represents the deeply contemplative aspect of Siva: the stillness beyond all movement, the peace of deep knowledge. The cave has eight monumental depictions of the themes of Siva made in panels. On the left of the great central image is Siva’s manifestation as Ardhanaresvara. Here, we see the unification of the male and female principles in creation. On the right is the depiction of Siva as he catches the personification of the river Ganga in his hair as she descends from heaven. He breaks the terrible impact of her fall, which could wash away the earth. Most reliefs here were considerably damaged when the Portuguese military garrison used to practice artillery fire in the hall. Colossal Buddha, Kanheri, 5th and 6th century. This figure, more than 22 feet (6.7 metres) in height, marks the beginning of a long tradition of colossal Buddhas, which became a popular representation across the Tibetan plateau and Central Asia.